At a certain point you're going to plan that gathering which you won't be able to attend. You're going to make your final arrangements. How will you be laid to rest? Will you be buried in casket? A coffin is tantamount to a casket but according to the Nosek- McCreery Funeral, Cremation and Green Services on-line infomercial, coffins, which have six sides, are no longer in; "Coffins are what you have seen in old movies," the site explains. 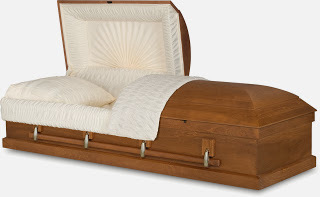 Will you have a casket cover and how much are you willing to have your estate, already hit hard by taxes, shell out? Will you go for the kind of simple pine box that can be found on Potter's Field or do you want a stately mahogany affair representing you on the bier? Dying intestate means there's no will, but if you don't declare in your will what will be done with your remains then the responsibility will remain with someone else. If you decide not to be buried in a casket, you may be cremated for considerably less money. According to NBC ("Cremation is the Hottest Trend in the Funeral Industry," NBC News.com 1/22/13) cremation is about one third the $6500 to be buried in a casket. If you're someone who enjoys getting in the last word, you may want to write your own good-bye or have it said by someone you think is going to get it right. By the time you're ready to die, your going to have been to a number of funerals and you'll have a good idea of your likes and dislikes when it comes to eulogies. Generally funeral services have to end early enough so that the entourage can get to the cemetery before it closes. You've always hated those funerals which start at 9 A.M., which means you have to get up early to get to the gym by 6:30. But what's even worse is the guilt inducing succession of activities which mourners are asked to attend--though some would say guilt goes with the territory. For instance the burial might be at 2, but the family won't be accepting visits from friends of the deceased until 6 so there is gong to be time to kill. Here is your big chance to right the wrongs of the past. You don't want to find yourself people pleasing from the grave, but you can make your send off memorable by caring for the needs of the living. Once you're dead you're dead and there's no need to hammer a nail into the casket by insisting that those who are living have to suffer through an overly drawn out send-off. And while making your arrangements you may want to pick up The American Way of Death by Jessica Mitford and The Loved One by Evelyn Waugh--essential reading for anyone planning to die.